For large monitor users (L) 1200x900 pixels 150KB (R) pictures are available. Here's a new feature called 'Drive By Shooting', which we welcome anyone to join by sending us a contribution. There are only a few rules: the picture must be taken while touching the vehicle that took you to the viewpoint; only minimal cropping and adjustment of the image is allowed; the picture must clearly illustrate what is really seen by motorists by carefully not excluding all the exciting visual crap that litters our man made landscapes; and sufficient details must be provided (preferably using a map) to allow readers to go there themselves. Like all poncy art projects this one has a manifesto, an arcane academic justification, a mission statement, resulted from a personal epiphany (we do not claim this took place on the road to Damascus, though examples from that region will be most welcome), and we could probably knock together a Submissions Committee if pressured - but we thought you might prefer just looking at the pictures, and pass on the tortured explanations. 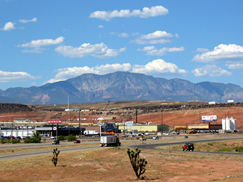 On the left is Interstate I-15, the major north-south road corridor through the Great Basin in the USA. The picture was taken from the east end of the St. George Boulevard overpass, in the city of the same name. In terms of altitude this area is the lowest part of the State of Utah, but the hills in the background, the Pine Valley Mountains, rise to over 10,000 feet of altitude. The picture on the right was taken by travelling north from the last location to where I-15 emerges from a hilltop cutting, just before the exit on state Route SR-9 for the town of Hurricane and the Zion National Park. Those mighty towering declivities on the horizon are the heights of Zion. 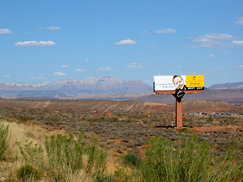 The foreground sign reads, 'It's A Great Place To Be A Kid', and is an advertisement for the Coral Canyon golf community. American pedestrian (1930-). This web log has featured a number of hikers, and even if you are unable to recall this one's name, you will most likely remember his speech as he took the first step on one of his famous walks. Another quotation attributed to him is less well known, "I believe every human has a finite number of heartbeats. I don't intend to waste any of mine running around doing exercises." Archived historic pictures of his companions at that time are available, and elsewhere their current activities are documented. Collectors of signed photographs eat your hearts out! His hike was just one part of a major series of events, said by some to be the crowing achievement of human science and technology. His own modesty about his part in all this is revealed in a 30th anniversary article, which appeared in his local newspaper the Cincinnati Enquirer. In view of his achievements, his former employer has seen fit to record a brief bare bones professional biography, strangely omitting that when as a clan member (special phrase: 'There will be moonlight again') he was offered, and accepted, the Freedom of the town of Langholm (the Muckle Toon) in the Scottish Borders on his 1972 world tour, many considered that to be his highest honor. Though some of our older staff remember local press and TV coverage of the event, we were unable to find a picture anywhere on the web. In 1972 amuseum about him was opened in his home town of Wapakoneta, Ohio. The museum building is in a visually impressive location, if that is an unretouched image. At the museum dedication ceremony in September he gave another speech. Lesser, though still notable, awards were a ticker tape welcome to New York, and the Medal of Freedom, which is the highest award offered to a US civilian. Lovers of trivia will want to know that his middle name is Alden; reports of his conversion to Islam have been denied; he acquired a pilot's license before acquiring a car driver's license; he is available for speaking engagements, and at the previous link you may see his current professional Speaker's Resumé with an accompanying and presumably recently taken photograph. You may also enjoy an amusing caricature that also summarises his achievement. I have a great fondness for visiting Don Burluraux' North York Moors CAM web site, where Don is currently showing the last section of his Cleveland Way walk. [This link has been updated to point to the first section, which is the only one currently available online. However, Don has made available his Cleveland Way CD-ROM. Ed.] This section runs ten miles from Scarborough to Filey. The picture tells you everything you need to know about the British Seaside. If you have been there as a child the memories may well be rushing back. Can you remember the feel of the donkey's dusty coat, and their smell? Certainly takes me back! An old Irish builder in Gloucester, England once referred to a braying donkey that was annoying him, calling it "A Bloody Jerusalem Two Stroke', which I remember every time I see one.